The Learning Canvas (Alexandre Magno, "How Creative Workers Learn") might be useful as a tool for brainstorming sessions. Since brainstorms meetings do not exclude any idea or judge any suggestions that come up from the team, normally many ideas are put forward. They are typically chaotic and not categorized or grouped yet. 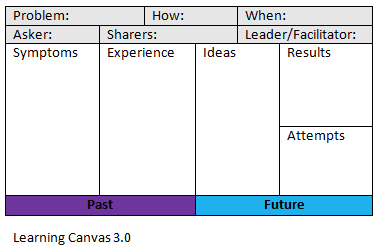 The canvas model (below) can help to sort out the various ideas by organizing them. It is a tool to help a Canvas guider (appointed by the leader/facilitator) to find possible solutions for the issue by examining the collected ideas. As so many ideas are brought up in a brainstorm session, the leader points out symptom by symptom connecting the experience and ideas from the participants bringing out the potential results and how to start with the issue defined by the attempts.